Since its inception in 2007, La Petite Robe di Chiara Boni has become renowned for its beautifully crafted eveningwear and workwear essentials. Based in Milan, the venerable label is focused on enhancing the natural beauty of women with its flattering, ladylike separates in innovative stretch fabrics. 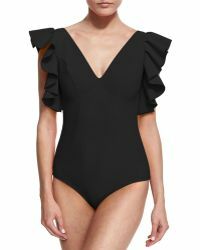 Update vacation wardrobes with La Petite Robe di Chiara Boni beachwear. Featuring flattering cuts, elegant colors and directional prints, the bikinis in the La Petite Robe di Chiara Boni beachwear are perfect for stepping out in head-turning style.